Super flat. It must be awesome. Depth is dead. That cell phone in your pocket keeps getting slimmer. Your television keeps getting flatter. The average size of breast implants is declining. Ancient man, by way of contrast, went big. The bigger something was the more prestige it signified. Stonehenge. Pyramids. The Empire State Building (given our current attention span, I feel comfortable referring to 1930’s New York City in the context of ancient history). Enough said. Size was equated with power. My current laptop has more power than the room-sized mainframes of years past and slobbering over a terabyte of storage is so turn of the 21st century. Now we prize miniaturization. The more power you can pack into a small space, the more obviously awesome you are. Like most human achievements, the basic impetus behind making technology more compact was our propensity to violence. That is to say, what truly inspires us to stunning technological feats is our desire to bash somebody’s skull in. If you’re going to fight a war, and make no mistake, given our historical track record, you are going to fight a war, you need beans, bullets, and band aids, but more importantly, you have to make sure you have your beans, bullets, and band aids in the right place at the right time. The smaller you can make things, the more bang for your buck. For example, the modern concept of canned food originated in the French Military offering a 12,000 Franc prize in 1795 to anybody who could come up with an effective means of preserving food. Why? The Napoleonic Wars were in the offing, and toting along enough fresh food for the troops was slowing down the process of conquering Europe. The answer? Slice it, dice it, stuff it in a sealed can, and your logistical train gets simplified, and you can go back to invading Russia. That’s also why we invented the bazooka. It’s kind of hard to stop a tank and hauling around cannon that pierce armor quickly gets tiresome, even when it’s practicable. You need something an infantryman can haul around on his back to even up the odds. And why send a large, expensive jet with a highly trained pilot, when a drone can deliver the same precision-guided munitions? We’ve come to take it as gospel, that technological progress equals miniaturization and a sleeker, low-profile package. This also explains the evolution of the shape of UFOs, which prior to the 1947 Kenneth Arnold sightings around Mount Ranier that ushered in modern ufology, tended to be ungainly cigar shapes or other equally bulbous behemoths. We’d just packed 16 kilotons of explosive power into a single atomic bomb ironically named “Little Boy” (16 Kilotons roughly equals what 220 B-29s carrying 1,200 tons of incendiary bombs, 400 tons of high-explosive bombs, and 500 tons of anti-personnel fragmentation bombs could have delivered). Not long after, unidentified flying objects started taking on the streamlined elegance of flying saucers. Before 1878, people saw plenty of unidentifiable stuff in the sky, but in the period from about 1878 to 1947, we started reporting the disconcerting presence of mechanical contraptions lurking about over our heads. What was so special about this particular time? Well, the Wright Brothers would achieve the first powered, sustained, heavier-than-air human flight in 1903. As a species, we’d made the great technological leap from mastery of the earth to mastery of the air (balloons don’t count, they’re fun at parties, but make a terrible machine gun platform and have this annoying tendency to fall when you poke holes in them). The proven feasibility of human flight started to make us suspicious of angels, lenticular clouds, comets, and a wide variety of atmospheric optical phenomena that previously seemed awfully signficant. I mean, now that we could fly, the host of supernatural phenomena previously assumed to be wafting about in the luminiferous ether seemed a whole lot less super, and a lot more likely to be natural. We had forevermore conquered the realm where only the mythological gods (and those wacky birds) dared and by doing so made a god of technology, eloquently expressed by philosopher Richard Bach when he said, “For pilots sometimes see behind the curtain, behind the veil of gossamer velvet, and find the truth behind man, the force behind a Universe”. In contrast to the gods that preceded it, technology signals it’s pre-eminence in an inexorable search for smallness that has fundamentally changed human existence (microbiology that pursues the tiny organisms that kill us and invisible organic processes that represent the building blocks of life in a quest for godlike immortality; microelectronics that support rudimentary artificial intelligence in your I-phone, so each of us may walk about with a witch’s familiar to whisper secrets in our ears; subatomic physics and the search for the unadulterated elixirs that make up the universe). Where the lofty peaks of mountains, the vast expanse of the plains, or the unfathomable depth of the ocean communicated a divine majesty in distance, the technological god is celebrated for his smallness, a world unto a wristwatch, with millimeters in depth and a slick, rounded profile. This incredible shrinking god emerges when we start truly looking at how things are put together, disassembling the universe so to speak, in the service of being able to rebuild things a little better because we’re pretty sure the gods would have done it our way if it had only occurred to them at the time, or as Terry Prachett wrote in Small Gods, “People start out believing in the god and end up believing in the structure”. Out on a philosophical limb, you say? Well, as the good Mr. Pratchett also pointed out, “it’s always worth having a few philosophers around the place. One minute it’s all is truth beauty and is beauty truth, and does a falling tree in the forest make a sound if there’s no one there to hear it, and then just when you think they’re going to start dribbling one of ’em says, incidentally, putting a thirty-foot parabolic reflector on a high place to shoot the rays of the sun at an enemy’s ships would be a very interesting demonstration of optical principles.” And so, after I wipe away the drool, to UFOs. Before 1878 there was a lot of diversity in the shape of those strange things we saw in the sky, their salient qualities generally being that they were (1) big, and (2) flying. In 1878, farmer John Martin reported a large, dark sphere moving at bizarre and inhuman speeds through the sky. The actual report from the Denison Daily News stated, “From Mr. John Martin, a farmer who lives some six miles south of this city, we learn the following strange story: Tuesday morning while out hunting, his attention was directed to a dark object high up in the southern sky. The peculiar shape and velocity with which the object seemed to approach riveted his attention and he strained his eyes to discover its character…When first noticed, it appeared to be about the size of an orange, which continued to grow in size. After gazing at it for some time Mr. Martin became blind from long looking and left off viewing it for a time in order to rest his eyes. On resuming his view, the object was almost overhead and had increased considerably in size, and appeared to be going through space at wonderful speed” (Denison Daily News, January 25, 1878). This was followed, beginning in April 1897 by an “airship flap” where all across America and Europe, people were seeing flying boats. In 1904, Lieutenant Frank Schofield of the naval vessel U.S.S. Supply reported bright red egg-shaped objects off San Francisco. From 1916-1926 we hear about “flying railway carriages”, “manhole covers”, and “huge wingless cylinders”. The “foo fighters” of early World War II were often described as large metallic spheres or balls of light. Sure, we might just be talking about different alien species with varying design aesthetics, but there does seem to be a change in the predominance of one shape over another over time, with cylindrical and cigar shapes (courtesy of the Nazi’s we were becoming intimately familiar with cylindrical rockets) being more popular prior to 1947, and the sleeker “flying saucers” appearing more frequently after the famous Kenneth Arnold sightings. Essentially, our unidentified flying objects started to flatten out as our aeronautical engineering advanced. I mean, heck, us mere mortals could lob a cylindrical object across the English Channel, so one would assume that big-brained extraterrestrials could overcome the necessity of cigar or balloon shapes, and work with a more funky wingless, saucer aesthetic. The technological gods demand smallness and flatness. The representatives of the technological gods (presumed to be extraterrestrials) obliged. And things just keep getting flatter. 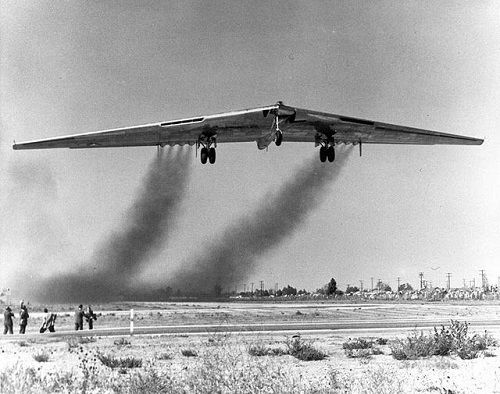 Since the 1970’s UFO’s have tended towards flat, triangular shapes reminiscent of our advances in stealth technology. We flatten and miniaturize our technology, and in order to demonstrate their technological superiority, our alien friends go even flatter. Jet propulsion! Bah, we don’t even have to put wings on. We just toss a saucer up. Presumptuous humans! Evolutionarily, the bigger something was, the more we should have been afraid of it. Mammoths, saber-tooth tigers, and cave bears, oh my! If it was bigger than you, it was likely able to kill you quickly and painfully. Then we invented stand-off distance (from spears to guns to cruise missiles), and we came to the conclusion that it’s not the size of the projectile, rather the punch of the package. This inevitably leads to the equation of technological advancement with the ability to make something really small and really flat, yet demonstrates enormous power. The big dude on horseback in the metal armor was the tank of the medieval battlefield until somebody who was tired of getting trampled conceived of the nice, portable, and easy to use crossbow. And it’s been a race ever since to make everything smaller and flatter. Even our unidentified flying objects. Pretty soon the pinnacle of technological development, the true homage to gods of the small will be technical inventions that we can’t even see. At that point, we’ll have come full circle and met up with our mythological forefathers, who were sure that it would all end up in dimensionless unity, as Pakistani poet Muhammed Iqbal said, “Thus passing through the infinite varieties of space we reach the Divine space which is absolutely free from all dimensions and constitutes the meeting point of all infinities”.